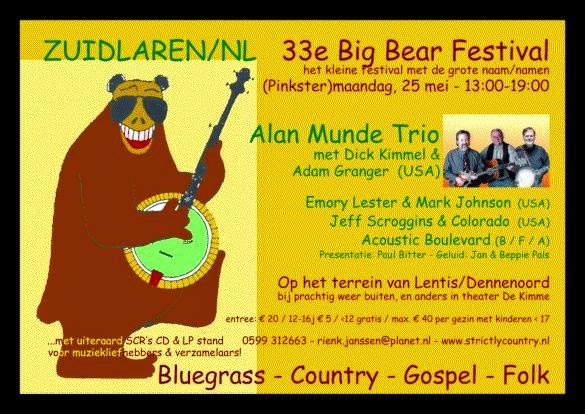 The roster of artists for the 33rd Annual Big Bear Festival in the Netherlands has been finalized. Rienk Janssen has been presenting and producing this bluegrass festival since its inception. In good weather the event is held outdoors on a beautiful field of grass, complete with a low-level stage made of stone. A perfect music and picnic area amongst the quiet of the trees (and some occasional soft church bells). If the weather does not cooperate there is a comfortable theater indoors... only a short 250 meters from the parking and stage location. There are many varied restaurants nearby and plenty of places to spend the night, including Bed and Breakfast choices and hotels in the area. All in all, a great way to spend an afternoon and early evening.